Magnesium sulfate is an inorganic salt with the formula MgSO4(H2O)x where 0≤x≤7. It is often encountered as the heptahydrate sulfate mineral epsomite (MgSO4·7H2O), commonly called Epsom salt. The overall global annual usage in the mid-1970s of the monohydrate was 2.3 million tons, of which the majority was used in agriculture. A variety of hydrates are known. The heptahydrate (epsomite) readily loses one equivalent of water to form the hexahydrate. Epsom salt takes its name from a bitter saline spring in Epsom in Surrey, England, where the salt was produced from the springs that arise where the porous chalk of the North Downs meets non-porous London clay. The monohydrate, MgSO4·H2O is found as the mineral kieserite. It can be prepared by heating the hexahydrate to approximately 150 °C. Further heating to approximately 200 °C gives anhydrous magnesium sulfate. Upon further heating, the anhydrous salt decomposes into magnesium oxide (MgO) and sulfur trioxide (SO3). Externally, magnesium sulfate paste is used to treat skin inflammations such as small boils or localised infections. Known in the UK as "drawing paste", it is also used to remove splinters. The standard British Pharmacopoeia composition is dried Magnesium Sulfate 47.76 % w/w, Phenol 0.49 % w/w. and glycerol (E422). In agriculture, magnesium sulfate is used to increase magnesium or sulfur content in soil. It is most commonly applied to potted plants, or to magnesium-hungry crops, such as potatoes, roses, tomatoes, lemon trees, carrots, and peppers. The advantage of magnesium sulfate over other magnesium soil amendments (such as dolomitic lime) is its high solubility, which also allows the option of foliar feeding. Solutions of magnesium sulfate are also nearly neutral, compared with alkaline salts of magnesium as found in limestone; therefore, the use of magnesium sulfate as a magnesium source for soil does not significantly change the soil pH. Magnesium sulfate is used as a brewing salt in making beer. Anhydrous magnesium sulfate is commonly used as a desiccant in organic synthesis due to its affinity for water. During work-up, an organic phase is treated with anhydrous magnesium sulfate. The hydrated solid is then removed with filtration or decantation. Other inorganic sulfate salts such as sodium sulfate and calcium sulfate may be used in the same way. Almost all known mineralogical forms of MgSO4 are hydrates. Epsomite is the natural analogue of "Epsom salt". Another heptahydrate, the copper-containing mineral alpersite (Mg,Cu)SO4·7H2O, was recently recognized. Both are, however, not the highest known hydrates of MgSO4, due to the recent terrestrial find of meridianiite, MgSO4·11H2O, which is thought to also occur on Mars. Hexahydrite is the next lower (6) hydrate. Three next lower hydrates—pentahydrite, starkeyite, and especially sanderite are rare. Kieserite is a monohydrate and is common among evaporitic deposits. Anhydrous magnesium sulfate was reported from some burning coal dumps. 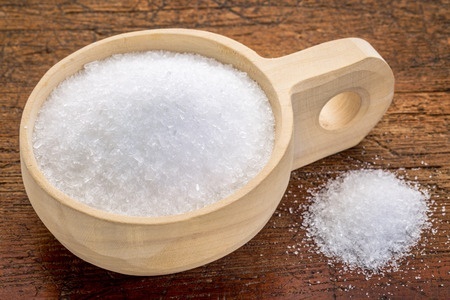 Double salts containing magnesium sulfate exist; for example, there are several known as sodium magnesium sulfates and potassium magnesium sulfates. An abnormally elevated plasma concentration of magnesium is called hypermagnesemia.